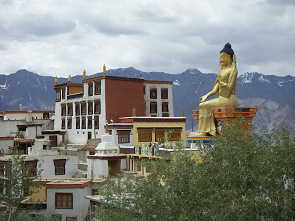 Leh is the capital of Ladakh (country of many high mountain passes). Ladakh is the extensive area of the east part of the jerky state of Jammu & Kashmir. It is the most remote and most thinly settled region of India. 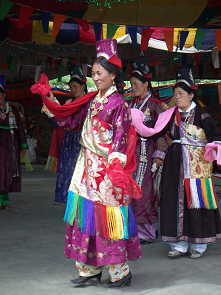 Often called "small Tibet", Ladakh is the last enclave of Mahaya Buddhism. The symbols of Buddhism are to be seen everywhere: Strings of colourrful prayer flags flying from the roof tops, as well as many great stupas and monasteries in the green valley of the Indus near Leh. 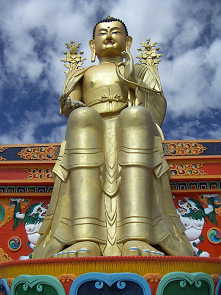 In mid August 2005 the Dalai Lama is expected to visit Choglamsar (10 km from Leh), where his brother lives. Leh is a busy town, which once was a stopover on the old silk road. 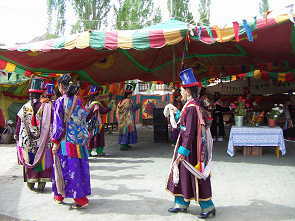 Ladakh was first opend in 1974 to foreign tourists. The effect in Leh is clearly visible today. Leh can only be reached for about four months in the year by road. During this time the place is inundated by tourists. There are many guest houses. People come from all over India to do their business: Kerala massages, Paschmina dealers from Kashmir, shoe shiners from the Punjab and begging children from who knows where. The picture of the streets is marked by the high pesence of military (close border to China), traditional Ladakhis, western young Ladakhis, Tibetan, faces from all over India and crowds of colorful tourists. In between them there are red dressed monks wearing sneekers, sun glasses and a baseball cap and often a branded T-shirt. A world of contrasts. Among the tourists there are special dynamics to be seen. Discussions develop into proper combat about who has experienced more adventures, seen more and been travelling for the longest. Many are in Leh for three weeks, stressing from one Trek to the next jeep tour. Sometimes I nearly have a bad conscience spending most of my time in and arround Leh. The tourists are a mixture of freaks and hippies, who go from one pub in Leh to the next, bores, pensioners and extreme-sporties who take the bicycle from Manali for the 500km to Leh over four passes (the highest being 5328m). There are other tourists with acute altitude sickness or fractures who frequently are seen by Elias in the hospital. A further symptom of the tourists is an exceptional helpers syndrome here. There are solar cells, which are not used. The children, going to school are not able to help the parents with the farm work at home and after graduation are not in capable of farming the fields or building a house. Things, which each Ladakhi used to be able to do. There are many further examples, which show which problems development brings. Consciousness for the environment is positive. Plastic bags are forbidden. It is possible to refill bottles with drinking water. In special shops regional products are sold at fair prices.